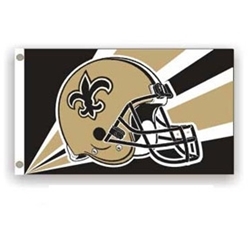 Display your Saints pride with a traditional 3x5 New Orleans Saints flag. The quality of this team flag will let everyone know which team you support. Our Saints flag, like all of our NFL FLags, is made of durable polyester. This team flag is finished with a white header and brass grommets making it the perfect choice to withstand the toughest competition. So go ahead and mike it game time by ordering your New Orleans Saints flag TODAY!